Let me take a deep breath and breathe in the good feelings this car makes you feel. Genesis allowed me to test drive this car for a week with my family in return of my honest opinion. If you know me and my family, we are a sucker for quality. Genesis is a new name for us in the manufacturer world and that made it a whole lot more interesting to see what all the features there is to be surprised with. The moment I laid eyes on this car, all I saw was luxury and one that has a mean, don't mess with me look. I leave when it's breaking sunrise so it's still gloomy and dark. I loved when I got to walk to the car and the side mirrors hug me with open arms like it just woke up with love and invite. The entrance to the door projects the lit Genesis symbol and I was already excited to get in for the drive. It doesn't stop there, it's just the beginning. The seat adjusts to your setting and the steering wheel automatically projects out to you. The Bi-Xenon HID headlights screams, 'look at me' accented with the fog lights and sleek front grill. The interior is trimmed with elegant lighting and your console and dashboard is ready for take off. You have so many amenities to make your drive as comfortable as possible. If it's cold, warm up your seats with the heated seats and vice versa. There is also a wireless charging port which makes things so convenient for those on the go. I am a busy mom with big kids and I am still on the go, go, go! I work in a corporate office so I am always mentally busy with business and personal priorities. It's nice to not worry about plugging devices in. You have one touch buttons (driver access and the other is in the back console) for the back window shade. The back windows also have available shades to block out the sun. They also can warm up their seats with the heated seats feature. You have business suits or uniforms for your kids practices and performances, this car is ready to accommodate hanging that for you. It also has a panoramic sunroof which is perfect here in sunny San Diego. Blue skies, palm trees and the sun! The drive, what a bubble of ooh's and ahhh's. I felt like the world was blocked out and I was surrounded by comfort. Who cares about the crazy, stressful, rude people out there. This car, the Genesis put me at ease. I put on some Jazz and I don't listen to Jazz but it was nice and relaxing. My seating was hugging me just right and I was driving with a nice, colorful, and bright head up display where I didn't have to move out of my comfort zone to get around town. It detects when you are in a school zone and slaps you in the face with a good speed limit display so you are well aware in safety. Speaking of safety, the Genesis speaks the language of safety. Lane Assist was one of my favorites. It displays green in the dash, and a green steering wheel in the head up display that you are driving safe and within the lanes. If it detects otherwise, it will help correct the move with a sway of the steering wheel going in the direction needed to stay safe within the lanes. There is also Blind Spot Detection which assists you in letting you know if the lane is safe to change . Also, if a car suddenly stops in front of you, the car has a safety brake system and will also show in the head up display. Power? Yes, this car has a V6 with 311 HP. Luxury that doesn't lag. Parking is a breeze with the parking sensors and camera. Such a perfect feature when you don't have time to second guess if you are too close or too far from an object. It will also tell you if there is on coming traffic when reversing and from what side. Yes! Storage, a MUST when we have a growing family. Trunk size is spacious for those bulk groceries, items from the kids games or performances, or perhaps just a huge shopping therapy day. Hands full, sway your foot under the car when you're close and the key fob is in your pocket or purse and the trunk opens. Push the button, it closes. The only gripes I have on this car is the cup holder that has 2 sizes. One is a regular cup size and the other is small. I wish they could just make them both regular sized cup holders with the adjusting tabs to fit smaller cups. Another would be the gas consumption. Even though there is different drive modes, you get minimal miles to the gallon. 22 combined, 19 city and 27 on the highway. Although there is Eco mode, it's still not much to the gallon. Sadly, as much as I try to see what else didn't please me, I just couldn't. I can really go on and on with this wonderful car. It's luxurious, comfortable, convenient, and a car of it's own. We truly enjoyed driving the 2018 Genesis G80. The price is amazing for what you get in this luxury vehicle. The package I drove was MSRP $52,825. The 2016 Kia Sedona, or Sedona in general has been on the top of my favorites list of the vehicles I have tested and reviewed. Courtesy of Kia, I was able to test drive the 2016 Kia Sedona SX-L and being in love with the 2015, I have fallen in a deeper love for this minivan. I have older children, one who is leaving to college and my youngest to follow in 2 years. To get to the point, I was NOT a minivan mom when my kids were younger and that was probably a big regret on my part. I never opted myself to give it a chance and see why they make these perfect beasts. Beasts meaning, they make life so much easier, less stress, and it's just "the life" in one vehicle. The Sedona has changed my perception of it all and I would absolutely LOVE to own one...if it was still one that would be suited for me. I beat myself by saying, "Why?!!!!!" and realize I could've saved myself so much sanity. My kids are in love with the Sedona and they have been in a few different minivans before with family and by far, the Sedona was their favorite. When I drive, I feel everything is blocked out, and the "Woooosah" starts to kick in and flow. What ever revolves inside the Sedona is just in it's own world and at ease. Got screaming kids in the back? Put on a movie. They will love it! If it's hot as heck outside, the climate control allows you to get them cozy and comfortable with clean air AC or vice versa when it's cold. Going on a long road trip? The reclining seats allow you to be in a VIP setting and feel like you are comfy at it's finest. The driver seat? Don't let me get started. Let's just say you are equipped with all of the top notch amenities. Heating and cooling seats, camera views, informative nav system that has all that you need from maps, radio and satellite radio, bluetooth, etc., heated steering wheel, drive mode go in eco or comfort version, two sunroof tops in the front and back, blind spot detection, traction control, fully loaded steering wheel to control at your fingertips, a dash that allows you to see everything you need, a console above you to access all the doors and storage to put your sunglasses in. Whether you have a small family to a big family, this vehicle caters. You can put down the third row seating for full cargo space and goes up for full people capacity and yet still have a lot of cargo space. My all time favorite is that being a busy mom, this van will allow you to rest comfortably which is the investment in itself! It's priceless. As a working mom, I had the chance to benefit doing my other personal work tasks in the van. I got to pop open my laptop and edit projects and more. I even had time to take a 15 minute nap before I got to head back from my lunch hour. What about those days you have to take your children to practice that's a good distance away and you have done all your errands but just don't have time to drive back home to relax because you have to come back and pick up the kids. Perfect nap time while waiting in the Sedona! I am trying to find anything that it can improve on and I just couldn't. If at minimal, I'd have to say to give more miles to the gallon for gas especially if an eco mode is available with the vehicle. However, being in eco mode did last me near a week. Visit Kia to see more awesomeness on the Kia Sedona and the rest of their line of vehicles. *This is not a sponsored blog and all opinions are strictly my own. The 2016 Hyundai Azera was pure delight to drive for the week courtesy of Hyundai. My family got to drive around this luxury, yet sporty vehicle that just puts you in that, "Ahhhh" state. When the car gets delivered, I like to refuse the delivery person from telling me all the features for the simple reasons of me discovering them on my own. I like to seek the needs of each feature as I drive the vehicle so I can see just why they are there or which ones stand out with it's unique creative design. I have to say that this car resembles several different luxury brands I know but will leave it as that. However, it does have it's own "look". The led lights brighten up this car when you drive on the road or for that look in someone's rear view mirror curious to know what cool car is that?! The power is spot on without any sluggishness or lag. The side mirrors were set to auto so they close up when the car is locked and armed but will wing out when the door is unlocked and unarmed or when you walk near the door with the key fob. The interior has that nice smooth, matte, tan leather. It opens the car with such light and its quite comfortable. Has a nice carbon fiber trim that gave it that edgy, yet sporty look. The trim also had the matte dusty metal which puts the look all together. It has the manual pull up shades in the back seating while the back main window has an auto shade with the simple push of a button at the center console of the car. You get plenty of leg room is the back, middle console of cupholders, AC vents and heated seating if you want to cozy up. Meanwhile, the front takes stage of all the goodies! The seat adjustments are located on the door panel with memory seating. Blind spot detection, traction, reverse side mirrors roll down on both the driver and passenger side. Dashboard has all the digital information you need by flipping the features you need to see with the push of a button. The steering wheel has all the goody controls at your fingertips. The center console has heating and cooling, parking sensors, back window shade controls, navigation, XM radio, bluetooth, apps, USB/aux/iPod ports and so much more. You also have your driver and passenger personal climate control. You will also find a hidden storage behind it where there are extra ports and space for devices that may need charging. There is a storage compartment between the seats. My favorite was the trim on the doors, passenger dash and hidden storage all lights up with a subtle blue trim. The roof console has the controls for the lights and the panoramic sunroof. Amazing to see the beautiful blue sky when the roof of just opens to the back seating. Trunk space is spacious. If it's one thing as parents need from a car, it would be trunk space. We will admit, we favored this vehicle for a luxury-sporty ride. You can find these features in our vlog as posted below. Perfect mini to a 2016 Mazda CX-5 who married the Mazda 3 and gave birth to the Mazda CX-3. Best way that I can put it. I absolutely loved the CX-5, but for some, they would love a smaller version. Courtesy of Mazda, I was able to test drive the 2016 Mazda CX-3 for a few days with my family. This vehicle will hug you with just the right amount of space to snug you comfortably, yet enough storage to be a mini suv. Sporty enough to handle a good ride, that's for sure. In my case, I do have a family with a 6 foot son, and a daughter who naps on every car ride, and a husband who has to have the seat leaned back because it is easier on his neck where his injury is. Thus, making the car ride a bit too snug for us. However, I can totally see this being perfect for a smaller family with younger and smaller children. Maybe you are single or have a loved one, or better yet just one to go out with your friends often. Although it was a bit snug, my son was in love with the back seating and how it accommodated comfortable seating. The headrest was arched to hug your head and adjustable with height. I really enjoyed the features. There is nothing that is missing in my eyes. My kids did wish there was AC in the back, but with the car being compact enough the vents were sufficient to circulate the inside of the car. Speaking of vents, they aren't your typical vents, they were circle vents that can be aimed in any direction. There is one vent in the middle of the dashboard as well that is hidden in the trim. The interior is quite nice as all of the Mazda's. You get your Blind Spot Detection, Tire pressure setting, seat warmers, nav system to include GPS, XM radio, apps, bluetooth, Sports Mode, moon roof, fully menu steering wheel. The exterior is pretty damn awesome! The black trim gives it a roadster look, charcoal gray rims, and that front, full-flush, sleek look finishes the look! That is one of the cool features with Mazda, they have a nice front to their line! Overall, the 2016 Mazda CX-3 is a wonderful car. Absolutely! If you like "compact" vehicles, then I'd say you met your perfect match! I don't see it fitting for my family just because we are a "big" family. Otherwise, I'd love to own one of these. Feel free to watch us drive around town in the 2016 Mazda CX-3. This car is an eye catcher! Courtesy of Hyundai, I was able to test drive the 2016 Hyundai Tucson Limited AWD for the week (MSRP $32,320). The first thing that caught my eye was that sleek look with those headlights. Then I thought the car was a deep, burnt orange but was actually a shade of red? The color is called Sedona Sunset. Fits perfectly! Either way, the shade was a unique one. The front was sleek and full flushed which does not have that cheap look. Let's be really honest here, I have to say that the design and feel for Hyundai has come a "long" way. The warranty is also ah-mazing. I did not expect to feel this sturdy, stable weight of a vehicle. It drove nice and smoothly. All of the amenities were there from a complete nav system, to seat warmers, controls on the steering wheel, blind spot detection, leather seats, proximity key so you can open your door without having to dig through your purse full of items, and my favorite...the trunk button to auto close. Even the rear view mirror had all the buttons for your garage opener, your SOS in case you get in an emergency situation, digital compass, etc. The only thing I would have to say as a con was that it didn't have the sun/moonroof. The car was very comfortable. My daughter had surgery the day we were test driving the Tucson. It was such a help to be in a roomy and comfortable ride. The gas mpg was average and not so much of a gas saver. But it didn't cost much to fill the tank either. Overall, I will have to say this is a wonderful vehicle if you are single, married, and/or with a small family. Perfect for road trips or just your day to day vehicle. Roomy and spacious. 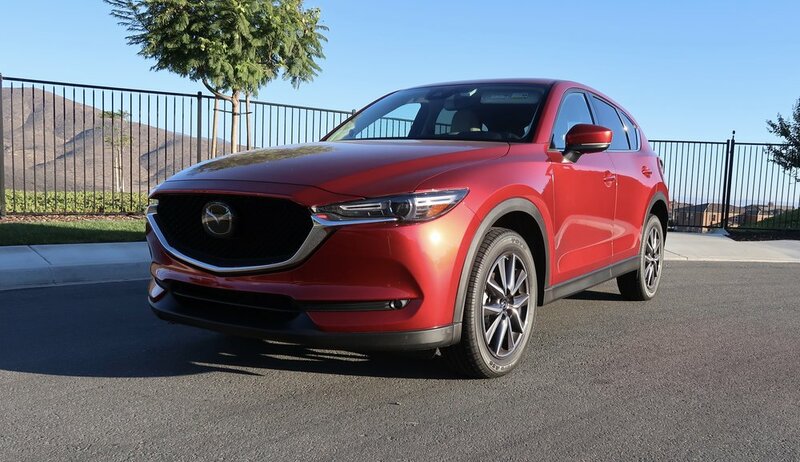 I think those are the key highlights of this compact SUV, the Mazda CX-5 Grand Touring. Courtesy of Mazda, I got to test drive this amazing vehicle for a week. I really liked the simple look of this vehicle. The rims had the charcoal look that put the whole look together. The thing with Mazda is that they have the nice two-toned interior that makes things look even more classier. The CX-5 was very roomy. The back had a lot of cargo space and I like the fact that it had a screen pullover in the trunk so that it makes you a bit more secure when you have items in the trunk and still have a lot of things to take care of while you're out there on the road. The center seat in the back opens to the trunk so which was pretty cool because our dog loved the open space to go back and forth feeling comfortable. I personally, still have to get used to the media dashboard. The volume and mouse in the middle does get me a bit confused at times. Not that it's a bad thing. It's just different. You have all the amenities of navigation, XM radio, bluetooth, etc. The steering wheel has all the controls, so thats great. I have a center mouse in my own vehicle and it's quite easy to maneuver. It's easy, clean cut, and user friendly. The pickup when you need it isn't the greatest , but I am okay with it. It has that wonderful feature called, blind spot detection. I giggle each time I say it because this little feature does so much. Driving around with the moonroof open, in San Diego makes the car just more enjoyable. Day or night. Speaking of night, the LED lights are the perfect glow driving this pretty slick and clean ride. It's a perfect car to have with a small family or even if you don't have children. It's great to own for all the space it provides and still drive in great style. One word for this car, AWESOME! Okay, I sound a bit cheesy, but the moment I seen this car I was so intrigued not only by the color but everything along with it! I was given the opportunity to drive the 2015 KIA Soul for a week, courtesy of KIA. The package I drove had all the amenities with the MSRP of $26,835. This enabled me to see what this vehicle has to offer my family of 4 on a real time basis. This begins from the start of my day to driving to work, escorting my kids to school and school activities, doing my errands, to family adventures. Aside from the amazing and unique look of the KIA Soul, comfort was immediate. The support of the seats cater to snug you and the heated and cooling seats along with the heated steering wheel put you at ease. I drove through many cycles of traffic and the KIA Soul allowed me to not feel irritable and uncomfortable. I also don't mind the cool stares at me on the street because the car stands out and looks pretty damn cool! I call it the Shrek Mobile because of the shade of green and how roomy it is inside. I have a 6 foot son who still has so much head and leg room in the car in both the front and back. My daughter loves playing music and enjoys that it has surround sound and that the speakers light up in different colors all the while of me having the amenities of the navigation as I am driving around being the busy mom as I am. What I really like is while I am taking care of business, there is plenty of cargo room in the trunk to stack up groceries and more while I am getting things done. You can also brighten up the day...and ride with the panoramic sunroof! Why not? San Diego is always sunny, perfect and gorgeous! Would I invest in one? Absolutely! This would be one I would invest in for one of my kids as a first car.